Mark Bryan Dula of Parañaque swims for the gold in the 12-under 50m butterfly event of the Batang Pinoy-Luzon qualifying leg at the Isabela Sports Complex in Ilagan, Isabela. ILAGAN CITY, Isabela, Philippines — Mark Bryan Dula of Parañaque harvested mints to emerge the first quintuple gold medal winner even as teammate Micaela Jasmine Mojdeh collected two more to make it a four-gold haul yesterday in the Luzon leg of the 2019 Philippine National Youth Games-Batang Pinoy at the Isabela Sports Complex pool here. 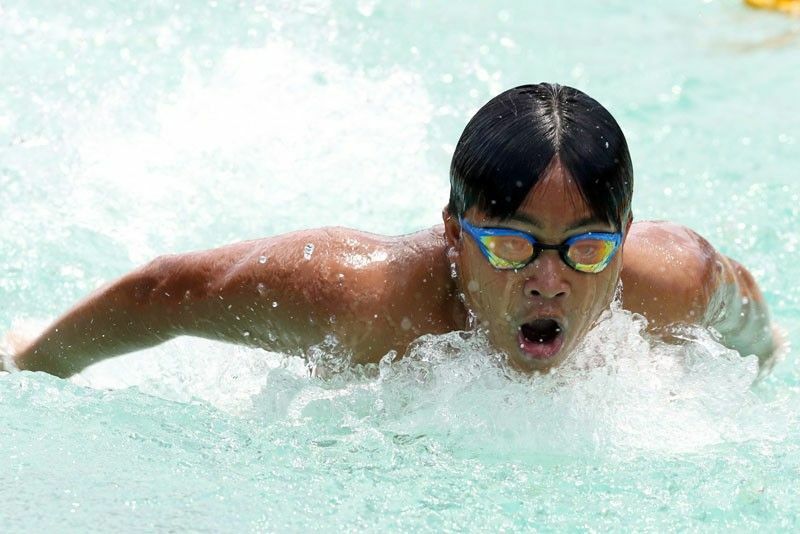 Dula, 12, took the 50-meter and 100m butterfly and 100m and 200m backstroke golds one after the other to cap his amazing Batang Pinoy debut with a five-gold collection, the most by anyone in this weeklong event for in and out-of-school athletes aged 15 years old and below thus far. The sixth-grader from Massville school, who ruled the 50m back the day before, timed in 30.78 seconds in the 50m fly, 1:08.82 in the 100m fly, 1:14.71 in the 100m back and 2:44.46 in the 200m back to sweep all five of the events he participated in. And Dula isn’t about to slow down. “I’ll be going back to training because I’m looking forward to my first Palarong Pambansa and hope to also win gold medals there,” said Dula in Filipino referring to the annual meet for elementary and high school athletes set late next month in Davao City. Mojdeh, a 12-year-old competing in the 13-15 age bracket, ruled the 100m fly in 1:06.30 and 50m fly in 30.44 and improved her golden collection to four. She is a cinch to win her fifth gold in the 200m fly today. “My goal is to swim faster and improve my time,” said Mojdeh, who once grabbed six golds and adjudged the Most Outstanding Swimmer in a Japan meet. In centerpiece athletics at the City of Ilagan Sports Complex, barefoot wonder Leslie de Lima of Camarines Sur was a class above the rest in claiming the girls’ 1500m gold in 4:51.5, or more than 10 seconds ahead of Laguna’s Magvrylle Matchino (5:02.6) and Taguig’s Samantha Nicole Caneda (5:02.09). Also striking golds at the track were Cavite’s Ron Gabriel Villa (boys’ hammer throw), Bulacan’s Marvelyn Canon (girls’ long jump), Camarines Sur’s Leslie de Lima (girls’ 1500m) and Baguio’s Hussein Lorana (boys’ 1500m). Baguio’s Aton Yuan Jucutan pocketed two golds in the boys’ cub 20m and 30m in the archery event at the City Hotel grounds. The other archery winners of the day were Baguio City’s Danielle Espiritu (girls’ cadet 30m), Dagupan’s Janina Erica Dolosa (girls’ cub 20m), Pasig’s Guillana Venice Garcia (girls’ bowman 30m), Makati’s Cassandra Louise Enecio (girls’ yeoman 20m) and Sophia Kyran Manuel (girls’ cub 30m), Marikina’s Sean Jonathan Tanco (boys’ cadet 40m) and Pangasinan’s Zhyrine Shayne Bastasa (girls’ cadet 40m). Jharie Matthew Masangcay of Pasig City won in the junior boys’ individual single weapon while teammate Irish Rueco reigned in the junior girls’ traditional individual double weapon in arnis.